"What in the World¹s Going On Here?" has now been revised and expanded to become an even more valuable goldmine of information on CD. There are many resources available for students who wish to study Creation Science, but there are precious few which give that same opportunity to study Bible history as truth. Join the quest with Diana Waring on this eye-opening tour through fascinating archaeological discoveries. You will see the movers and shakers of antiquity in their hair-raising adventures, get that behind-the-scenes view of controversies between prevailing opinion and Scripture and discover God’s mighty hand at work in the events of history from Creation to Jesus Christ. A Christian perspective of world history. 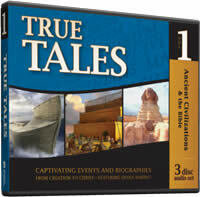 A storyteller’s approach, this series goes through several millenia of history and includes the progression from creation through the rise of the first civilizations, the times of the Greeks, Romans, Israelites, to the Messiah. Diana Waring will take you on an extraordinary learning adventure revealing Jesus Christ as the centerpiece of all human history. 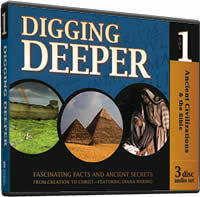 You will explore the Old Testament as the ultimate "textbook" for ancient world history. 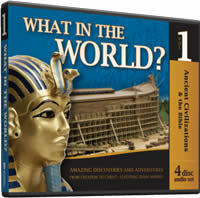 You will learn about archaeology, ancient histories, Old Testament prophecies and contemporary research in a style that will help you put world events into a simplified, usable time frame. Diana will teach you how to re-evaluate world history from an eternal perspective: God’s sovereignty over the affairs of men and nations.